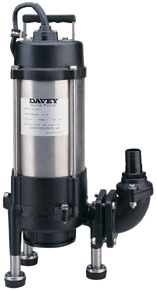 The Davey product line boasts an extensive range of sump anddrainage pumps. Not only do we have a broad range of electric submersible models, we also have surface mount self priming models. Removing waste water from process plants, factories, building sites or mines. Davey Grinder pumps are really tough suckers, engineered for use in applications like pits and septic tanks, and designed to grind black water with solids down to size. The submersible Grinder range has the ability to turn even nylon rope or nappies into fine particles so they can be pumped through a 1 ¼” pipe. These are real grinders! If you’ve got waste water that contains a high portion of soft solids in suspension, Davey has a solution for you. These products are ideal for dairy or piggery waste, liquid food transfer and water transfer. Sewage PumpsSewage or ‘grey’ water containing soft solids is ideal for these pumps. These submersible pumps are designed to pump semi-screened raw sewage and grey water with ease. When string-like materials may be present, the Cutter or “K” models offer the additional advantage of a special cutting tip on the impellers.